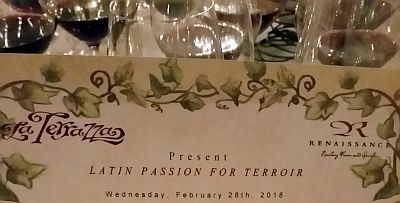 This special dinner at La Terrazza for Vancouver International Wine Festival we were able to experience the synergy of wines from Spain, Italy and Uruguay, evoking passion along with the culinary treasures created by Chef Gennaro Iorio. We sampled wines from Bodega De Moya (Valencia), Dominio De Punctum (La Mancha), Bodega Garzon (Garzon) and Tenute Silvio Nardi (Montalcino). All four of these wineries were specifically selected for this dinner in part because they are family run wineries which have a passion for their terroir. Dominio de Punctum in 2005 became an organic winery and in 2006 became a biodynamic winery. Bodega Garzon has 200 ha of vineyard planted, but has divided the vineyards into more than 1000 unique plots so that they can get the best grape variety on each plot; each micro-terroir. Bodega De Moya was the dream of a passionate and successful Belgian businessman, Yves Laurijssens, who decided to leave the Belgian factories behind and dedicate his life to his passion for wine in Valencia growing the Bobal grape in high altitude vineyards. Did you know that the Bobal grape is the second most widely planted red varietal in Spain? Tenute Silvio Nardi is one of the original six producers of Brunello to form the Brunello di Montalcino Wine Consortium. Dominio de Punctum Lobetia Bubbles NV sparkling wine is made from Chardonnay. It is off-dry, floral and citrus flavours with a medium bubble. I really enjoyed it with the scallops. The lime in the dish enhanced the flavours in the wine. 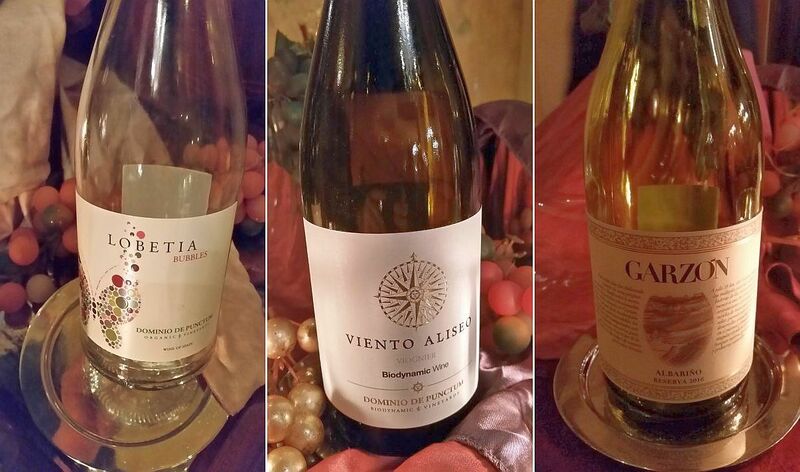 Domino de Punctum Viento Aliseo Viognier 2017 showed lychee, white flowers and orange on the nose. It is off-dry with medium acidity. Oranges, citrus and green fruit flavours. Long length with a tart finish. This was a complementary pairing with the Yellowfin tuna. The citrus and chillies in the dish complemented the flavours in the wine. The dish itself was very flavourful. I enjoyed those flavours as well as the strong cilantro, and the texture from the caviar served alongside the tuna. Bodega Garzon Reserva Albarino 2016 showed to me the importance of serving wine at the appropriate temperature. White and red wines served too warm hide the fruit flavours and can make the wines feel a bit flat. I tried this wine twice, the first time too warm, and the second time appropriately chilled. In the too warm version, the wine did have a light crisp apple and peach nose. Medium plus body, higher acidity, some roundness, and flavours of pepper, oak, apples and peach. The flavours though did not pop. With the appropriately chilled wine, the wine really showed a lot more peach along with orange, and a salty mineral component, owing I am told to the nearness of the vineyards to the sea. It was like tasting two completely different wines. with chilling. Another complementary tasting The swiss chard texture along with the freshly cooked, fatty sablefish, and the lemon vinaigrette were perfect together. The acidity from the wine and salty minerality added more brightness to the dish. Domino de Punctum Tempranillo-Petit Verdot 2016 had a nose of ripe red fruits and dusty aromas. Full-bodied and spicy with medium acidity and fine tannins. Flavours of violets, black and red fruits. 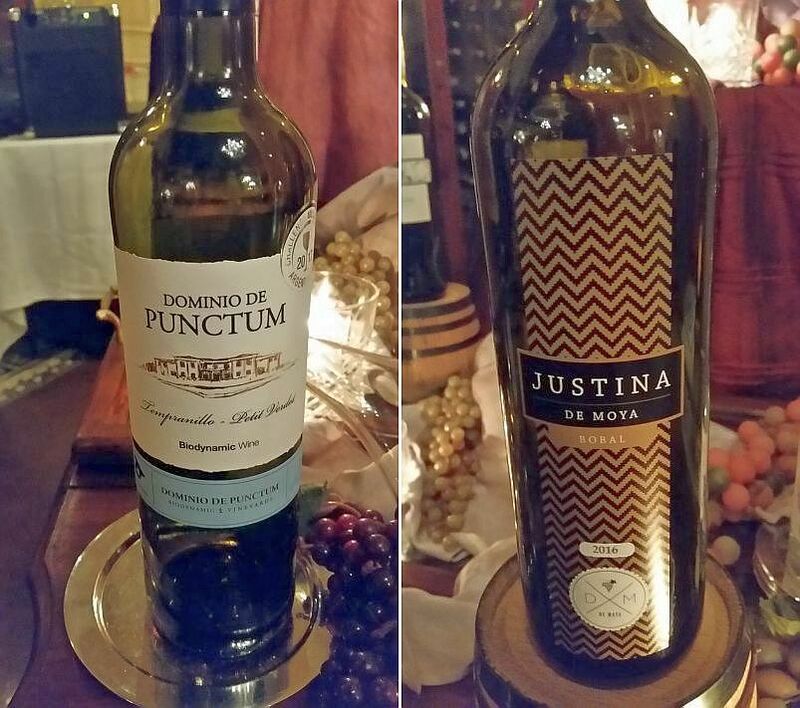 Bodega de Moya Justina Bobal 2016 had a very unique nose to me of beef jerky or charcuterie. Full-bodied, round with medium acidity. Flavours of ripe black and red fruits, in particular raspberries. Medium tannins. Excellent. The ravioli was a delicate dish, but richly flavoured with onions, porcini mushroom, and butter. I did not make a note of which wine I preferred with the ravioli, but I think I gave the Justina a slight edge with the more full fruited flavours. Bodega De Moya Maria Bobal 2015 is a step up in quality over their Justina wine, with 12 months of oak ageing. The Justina has 4 months of oak ageing. This wine has a very light red fruit nose. Medium plus body and medium acidity. This wine is smooth. Tasty ripe black fruit and nutmeg flavours. Some residual sugar in this wine. Very enjoyable. Tenute Silvio Nardi Rosso di Montalcino 2015 is fermented in stainless steel tanks with skin contact, then the wine is matured in new and used casks for 12 months, followed by bottle ageing. This wine can be enjoyed without further ageing and has been called a ‘mini Brunello’. This wine has a light red fruit nose. Dry with higher acidity and medium tannins. Red cherries, red fruits and pepperiness on the palate. Quality. The veal tenderloin, cooked sous-vide was soft textured, and was complemented by the sweet, creamy celery root puree, and the tart slaw. Again I give the Bodega De Moyal Bobal an edge over the other wine in the pairing due to the ripe fruit flavours, and its smoothness, complementing the flavours of the veal tenderloin. 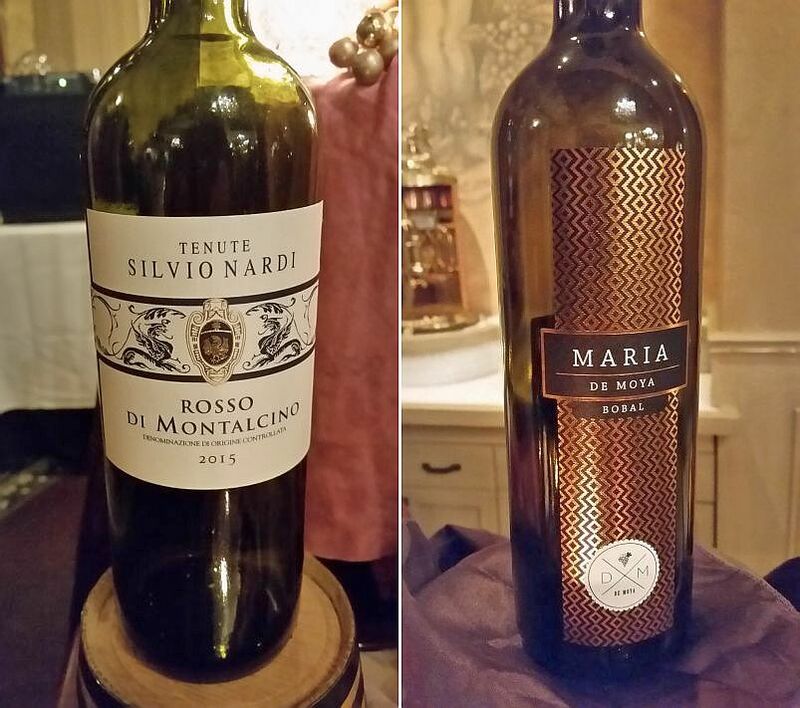 Tenute Silvio Nardi Brunello di Montalcino 2012 has a light red fruit nose. Off-dry with medium minus body and light mouthfeel. I enjoyed that this wine has a mineral streak to it. The wine shows red fruit, floral and pepperiness on the palate. Medium tannins and higher acidity. Bodega Garzõn Single Vineyard Tannat 2015. Of all the wines at our dinner, this one was completely opaque; Opaque ruby. It has a light violet nose. Dry and soft, with medium acidity. Sweet ripe black fruit and sweet spice flavours. Finishes dry with medium tannins. The lamb cooked two ways, braised and slow-roasted, had one wine pair better to it. The braised lamb shank and the Brunello di Montalcino was an excellent pairing, and the slow roasted lamb loin paired the best with the Bodega Garzon Tannat. I like the spice in the slow roasted lamb with the flavours of the Tannat. With a dinner like this, with many pre-poured wines, and dishes coming one after the other, and great conversation with your new friends to the left and right, making studious notes is quite difficult. I hope what I have written gives you a hint of these food and wine pairings. Give these wines a try, and give La Terrazza a try as well for fantastic food. Thank you to the Vancouver International Wine Festival for providing me a ticket to attend this event to review, to La Terrazza for their well-composed and flavoured dishes, and the four wineries that provided their wines for us to enjoy.